The Law of God is of great value. For the Christian it is a reflection of God’s righteousness, a rule of life that reveals God’s will, and a reminder of our need for redemption. Knowing that a man is not justified by the works of the law but by faith in Jesus Christ, even we have believed in Christ Jesus, that we might be justified by faith in Christ and not by the works of the law; for by the works of the law no flesh shall be justified (Galatians 2:16, NKJV). Therefore the law was our tutor to bring us to Christ, that we might be justified by faith (Galatians 3:24, NKJV). And dooms to death when we transgress. And seek deliverance ere too late. Saved by His grace through faith alone. Let us praise the Savior’s name! And felt no inward dread! And thought my sins were dead. I find how vile I am. And thus redeem the slave. Is all the law can do. 4. Jesus, how glorious is Thy grace! That makes a sinner just. Not any sure, on nature’s ground. 2. Ah, whither shall I fly? 3. The sinner stands condemned to die. No sin of his remains unknown. Deserving judgment from God’s throne. To be forgiven and made pure. Thy wrath in one eternal shower. Lost and undone, I come to Thee. Shine the Light revealing sin! As their hearts are bared within. See yourself before God’s Law! Dread the wrath of God in awe. Furrows that His Law has made. Come you sinners, look to Jesus! He’s fulfilled the Law’s demands. Into love for God’s commands. Sent to show us our great need. And in Him we shall be freed. That we shall come unto grace. The Law shows us God’s righteousness and glory. It shows us our sin and need for salvation. And it shows us God’s will, how we are to live as creatures made in His image. In the next post we will look at hymns that highlight the use of the Law as a rule of life. 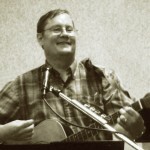 Ken Puls is a follower of Jesus, husband, father, worship leader, guitarist and songwriter. He and his wife, Celest, have 2 sons and 2 daughters. Ken is originally from Omaha, Nebraska, where he studied classical guitar and music theory at the Omaha Conservatory of Music (1973 to 1980) with Leonard Mostek. In 1980 he continued his study of music at the University of Nebraska at Omaha, receiving a BM (1985) in Music Theory and Composition. He is also a graduate of Southwestern Baptist Theological Seminary where he received the MM (1990) and PhD (1998) in Church Music Ministry. He and his family moved to Cape Coral, Florida in January 2003. Ken directs the online Founders Study Center for Founders Ministries and is an editor for Founders Press. He also teaches classical guitar and music theory at Florida Southwestern State College (FSW) at the Lee campus in Fort Myers, Florida.